Published By : The Perak Library, Ipoh. 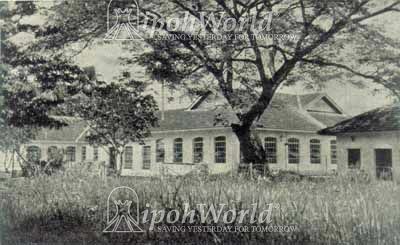 The picture portrays the Ipoh Trade School. In 1930, the Trade School in Ipoh was founded, based on the success of the Kuala Lumpur Trade School (See Pre-history below). The initial intake was 25 young men of which 23 were Malays with 1 Chinese and 1 Indian. The Chief Instructor was transferred from the Federated Malay States Railways Central Workshops (where he was District Engineer for the Railways) and his assistant from the Kuala Lumpur Trade School. The new Trade School was situated directly opposite Anderson School. The students' first task was to assist in the construction of the school building and installing machinery. Practical training took place on Albion and Thornycroft lorries of the Public Works Department Ipoh. Each student received $10 per month as a scholarship. Tuition, overalls and shoes were provided free once per year. Initially, accommodation and food was provided in a shophouse by a contractor at $8 per head per month. Eventually part of the first Anderson School Hostel, established in 1921, was given to the Trade School, despite it already being quite crowded. For the following 2 years, another 25 students enrolled and the school operated a 3 year training course to a set syllabus. Final year students gained experience by undertaking work for other Government Departments, such as repairing hospital ambulances. At first this work was completed free of charge but when charges were brought in, the Education Department earned $7,500 per year from the boys’ labour. From 1939 to 1941, the school also supported the British Military in Perak, but in December 1941 the Japanese invasion reached Perak and the school was closed, all equipment being removed by the Japanese. The school was reopened after reoccupation and introduced extra training in electrical engineering, bricklaying and carpentry in addition to its previous syllabus. In the early 1920s, Ipoh requested federal support for a trade school; this was years before the one in KL was set up. The response (twice) was that money was scarce. Plausible, you might say. Then in 1923, the federal government finally agreed to help set up a school in Ipoh — but the next thing you knew, one was being set up in KL instead, and with federal support (that is to say, partly with Ipoh’s money). Jack Jennings, Editor of the Times of Malay6a, was livid. When the school finally received federal support in the late 1920s it was partly because the Perak River hydroelectric project was underway. When the school opened its doors in 1930, training in electrical work was immediately available with the eager cooperation of Perak River Hydro. One of the company’s primary sub-stations was in Silibin, and many of its engineers worked and lived in Ipoh. Finally, construction began in 1928 and the school opened in 1930 as stated above. To read more about The First Anderson School Hostel, Ipoh, click here. To read more about Anderson School, Ipoh, click here.